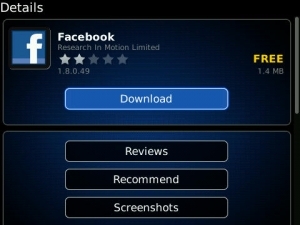 Facebook for BlackBerry 1.8.0.49 available in the App World | BlackBerry Blast! Facebook for BlackBerry 1.8.0.49 is now available in the BlackBerry App World. Earlier today CrackBerry reported version 1.8.0.30 was available in the Beta Zone, but it looks like that version has been pulled and a new official 1.8.0.49 is in the App World. Reports are that the new version of Facebook is showing up for some users and not others, so it may be device specific, but give it some time and it should be showing up for everyone.